: Yes. We'll hook a space cruise booster we found in Luna 2 onto a shuttle. : A space cruise booster... We used one of those in the last war, too, didn't we. : Sure, but how will you avoid the space debris floating between the Earth and moon? : Yeah. There's tons of wreckage still left over from our final battle with Bodolza. : My flying'll keep us clear of all that, no problem. : Yikes, you really like to push your luck, don't you? : I don't need to hear that from you. : Duo... I know your skill will get us through safely. : Y'know, I think that's the nicest thing you've ever said to me. : If all goes well, we can reach the moon before Dekim's Adrastea does. : Alright. Just stay on the safe side, okay? 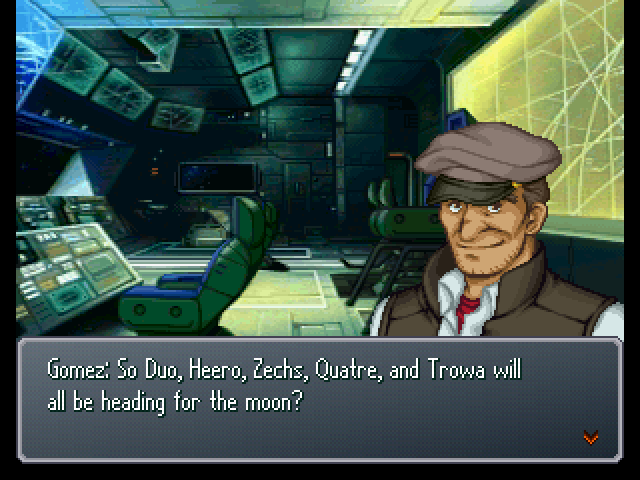 : ...Captain Gomez, I'll go with Heero and the others. 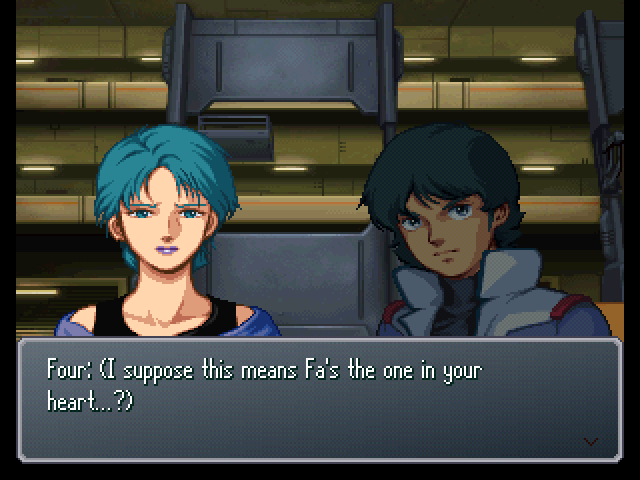 : No, we need you on board this ship along with Judau and Usso, to keep it safe. : It's about time for us to head out. We can't be late for the party. : Oh, and no hard feelings if I don't leave anything for you guys. 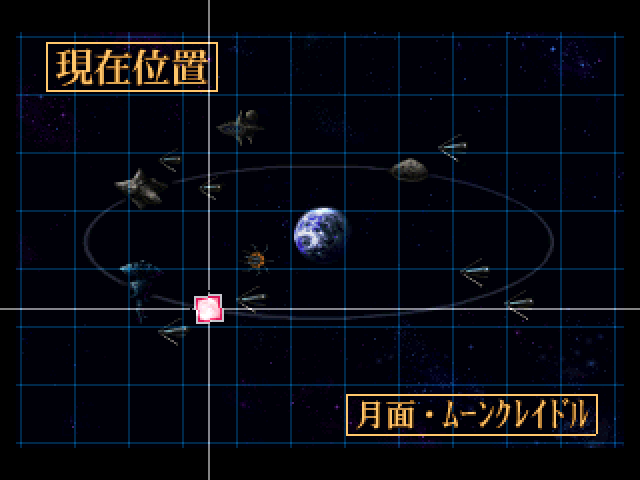 : Heero and the others have left. : Say... Who is it that's on the moon? : ...I guess there's no hiding anything from you, is there. Fa's on the moon. : ...What's she doing right now? : She's helping out with Project Aegis at Mao Industries. : I see... And you're worried about her? : Yeah... 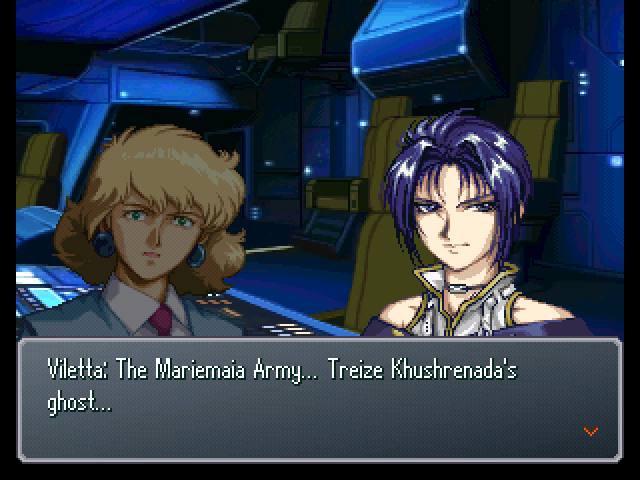 But I'm sure she's in capable hands with Heero and the others. : But didn't Ryune and the Valcione go missing? 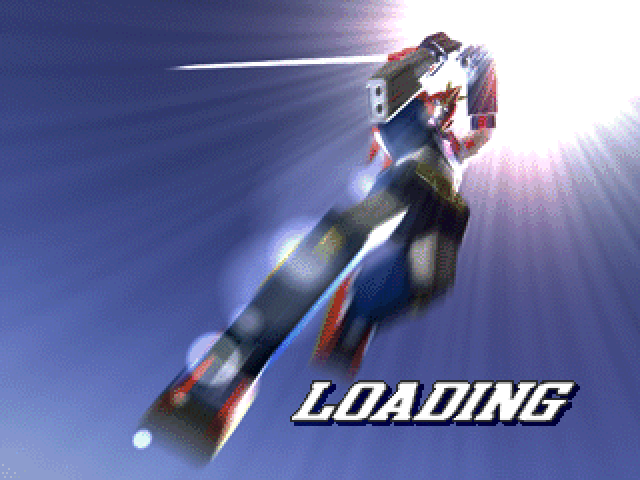 : Ring, prepare my R-Gun for launch. : Eh...? That's been here!? : Yes. The Titans appropriated the other R-series machines, but... 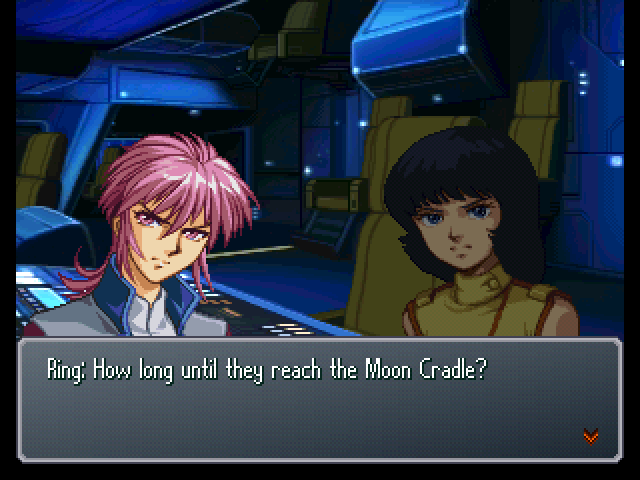 I let them think that my R-Gun was scrapped in the last battle, and brought it here, to the Moon Cradle, in secret. 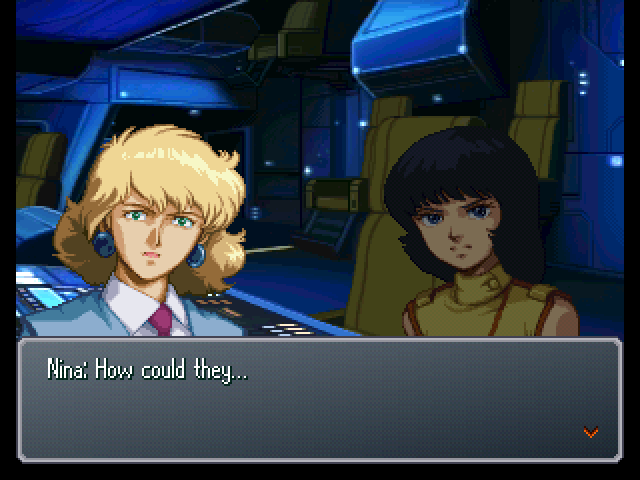 : Also... Nina, what about the Gundams that Heero and the others left here? : They're ready to launch at any time. : Don't. If you go out there, this Moon Cradle will become a battlefield. 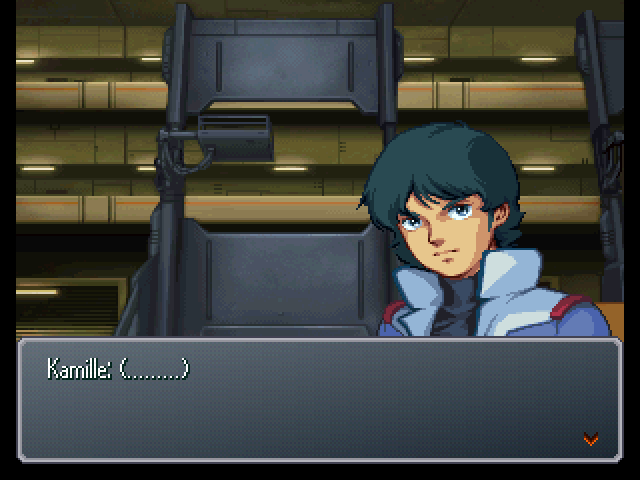 Project Aegis's microwave transmitter isn't the only thing here. There are thousands of people asleep in the artificial hibernation facility underground! : ...So we should keep the enemy from forcing their way in here, right? : But you going out there alone won't...! : This is my type of mission. That's why I'm here, and not with Ryusei and co.
: Don't worry. I'll buy some time until the Lean Horse team shows up. 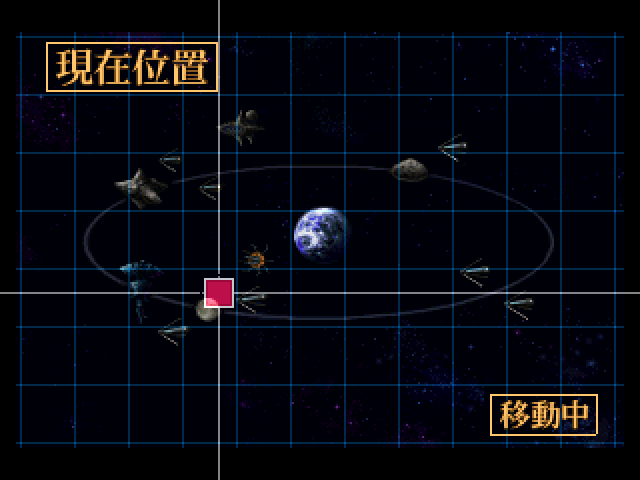 : Then I'll calculate Heero's arrival time, and prepare the Wing Zero and others for launch. : Viletta, I'm going with you! : (.........) ...Leave the dangerous part to me. : No, as someone who was also a participant in the Balmar War... 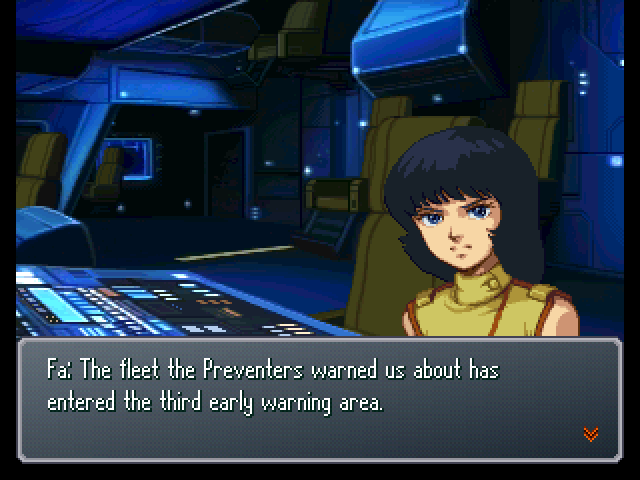 I can't let the people of the Earth Sphere get exposed to any further danger!